This class was officially added to the Citrus Engine on November 26, 2012. This post is out of date. For information on the latest version of Airxbc, see this page. Lately I've been working on a new native extension that makes it possible to control your Adobe AIR games using the Xbox 360 controller. I'm currently calling it Airxbc (Air Xbox controller - ha HA!) and this 0.5 release is pretty much just an alpha test to get something out there. It think its pretty cool and plan on putting more work into it in the relatively near future. If you're interested, check out the video and details below! I've recently been toying around with the Axel Game Library (www.axgl.org). I'm really liking the library so far as it is based on Flixel, but also utilizes hardware rendering. This means you get better performance and is especially nice for mobile devices. Multithreading in ActionScript 3.0: A Bad Idea? One of the most talked about features in the new Flash Player 11.4 beta is the new concurrency model which allows developers to spawn worker threads to handle intensive operations. While many people are singing the praises of multithreading, I can't help but to feel like this may not be such a great thing. A few friends and I have been working on a game together for the last few weeks. Everything was going well at first, but then we ran into a major snag: bullets were colliding with the ground when they clearly shouldn't have been. We are using Flixel and FlxWeapon from the Flixel Power Tools and we would see the issue pop up only on uneven terrain. If we changed our map to a basic, flat piece then everything worked as expected. However, introducing varying height platforms in the map would cause the issue. The image below demonstrates the problem. 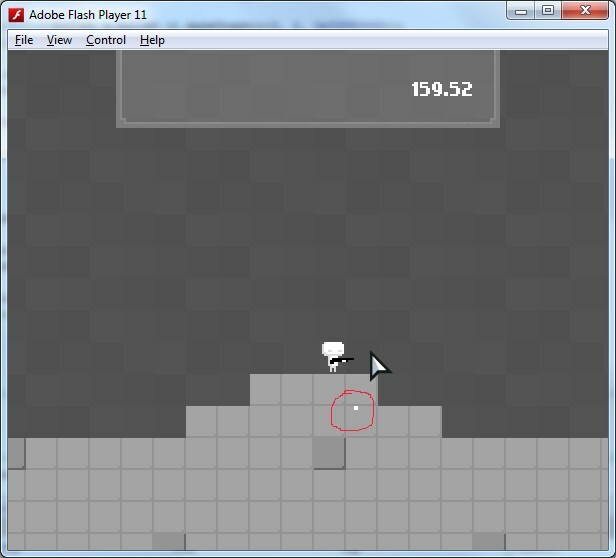 Both Flash Player 11.4 and the AIR 3.4 SDK are available now from the Adobe Labs site. The update brings some pretty big features to the Flash platform including multithreading and better support for iOS development. I'm not a big proponent of threading and concurrency in programming, but the iOS additions sound pretty nice. You can now deploy your applications to your iOS device without going through iTunes and you can receive push notifications and utilize iOS SDK 5.1 features. You can go here for more on AIR 3.4 and here for Flash Player 11.4. I've been seeing a lot of posts around the web the last few days about a new ActionScript 3 library, AS3MUL. The MUL stands for multiuser library. Of course this captured my interest and today I decided to play around with it. I'm pleased to say this library is really good! I was able to get a simple multiplayer scene up and running in just a couple of hours! You can check out my simple demo here, head to the AS3MUL website to learn more about it and download the library from google code. To see actual multiplayer with the demo either have a buddy sign on with you or just open the demo page in a second browser window/tab. You are currently browsing the archives for the ActionScript 3 category.